Fatimah Abbouchi has found an innovative and disruptive solution for the governance of projects, programs and portfolios. She uses her experience in process improvement, business administration, project management and as a small business entrepreneur to tailor flexible and efficient solutions for client projects, programs and portfolios. Fatimah’s business, Agile Management Office (AMO), has developed a disruptive approach for the governance of projects, programs and portfolios known as ‘The AMO Method’. This approach improves project success rates by providing a flexible, supportive environment for them to succeed. Fatimah started her first business, BoochiCo, in 2011, providing process improvement consulting services to small businesses. She started AMO in 2016 after identifying a need for a disruptive approach in the governance of projects, programs and portfolios as traditional ways didn’t cut it. AMO has 10 employees and is fast growing. It offers proven portfolio, program and project governance methodology, capability uplift and assessment services to federal and state governments and the banking and financial services, mining, FMCG, manufacturing, aviation, utilities, healthcare and pharmaceuticals industries. A traditional Project Management Office (PMO) is a group in a business project that defines and maintains project standards. Services include benefits, risk, issues and dependency management, project schedule and budget management, resource management, defining work breakdown structure, project planning and forecasting. A typical PMO’s framework, processes, templates and tools often change with each new function. Many organisations end up with multiple PMOs doing the same thing differently, which is inflexible, rigid “one size fits all” approach. The dynamic and responsive AMO method targets high value areas, shifting priorities and focus to where it’s needed most while sharing learnings, uplifting capability and using transparent methods. Fatimah is known for her patience, persistence and flexible methods that ensure quality outcomes that meet clients’ specific needs and expectations. 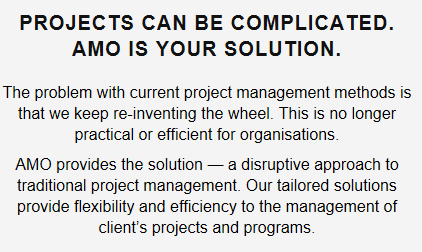 “We keep re-inventing a wheel that is either not practical or flexible for organisations, to ensure projects and programs are managed effectively and efficiently,” Fatimah says. Fatimah is a dynamic professional but felt she needed a mentor for independent support, assistance and to bounce ideas off. After a client suggested she use SBMS, she chose mentor Clinton Bugg. A small business entrepreneur, Clinton uses his extensive business consulting experience to help small businesses in research, business strategy, start-up and growth planning, expense management, revenue generation and cash flow management. Clinton says Fatimah has developed her skills in a range of areas and is now a key person of influence in portfolio, program and project governance practices and procedures. She delivers quality consulting, training and education services to businesses as an independent contractor, and provides specialist PMO services across a number of industries through AMO. Since seeing Clinton, Fatimah’s self-confidence to pursue her personal and entrepreneurial business aspirations has improved. Fatimah says Clinton helped instil confidence and supported her to minimise the pitfalls in her business while navigating the path forward, as he had experienced similar situations in his career. Without Clinton’s knowledge, support and guidance, Fatimah says she may not have been able to do some of the amazing things she has over the last four years and more so in the past 18 months with AMO. “He has really helped me to grow and develop my business acumen and become aware of pitfalls in business,” she says.